Daniel began his training in Classical Fencing (Foil, Epee, Sabre) in 1974, under the instruction of Maestro Tau hi Bac. Daniel fenced competitively for years as well as assisted in instructing. 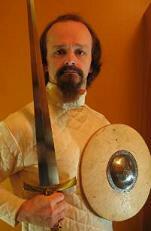 He has fought and instructed in both armoured and rapier medieval re-enactor combat in the SCA since 1981. Daniel has studied Fiore's system since 1999, and I:33 sword and buckler since 2003. He is trained in First Aid and has completed the National Coaching Certification Program - Parts A and B. This page was last modified on 29 October 2008, at 12:00.